Game recaps plus the latest on Travis Zajac, Johnny Gaudreau, Pekka Rinne and more in your NHL morning coffee headlines. NHL.COM: In his first game since recovering from a concussion, Pittsburgh Penguins goaltender Matt Murray had a 38-save shutout performance as his club blanked the Toronto Maple Leafs 3-0, snapping the latter’s five-game winning streak. Evgeni Malkin scored twice and assisted on Kris Letang’s goal. 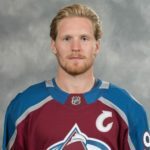 Gabriel Landeskog tallied a hat trick, Mikko Rantanen had four points and Nathan MacKinnon collected three assists (though his six-game goal streak ended) as the Colorado Avalanche beat the New Jersey Devils 5-3. Taylor Hall had a goal and two assists for the Devils, who lost forward Travis Zajac to an apparent right-leg injury in the second period. No word as to his status following the game. It was also a hat-trick night for San Jose Sharks’ forward Logan Couture as his club trounced the Buffalo Sabres 5-1. Former Sabre Evander Kane picked up two assists while Martin Jones made 24 saves for the win. Winnipeg Jets defenseman Dustin Byfuglien marked his return from missing two games with an upper-body injury with a goal and two assists to lead his club to a 4-1 win over the Vancouver Canucks. Jets captain Blake Wheeler became just the second player in franchise history to reach 500 career points. After scoring just four goals in their first five games, the Arizona Coyotes struck four times for a 4-1 win over the Chicago Blackhawks, spoiling the return of Blackhawks goalie Corey Crawford from a concussion injury. Former Blackhawk Vinnie Hinostroza scored twice for the Coyotes. Valtteri Filppula, Andrew Ladd, and Scott Mayfield each had three-point performances as the New York Islanders thumped the Los Angeles Kings 7-2. Isles goaltender Robin Lehner left the game in the third period after taking a shot off his mask. No update yet on Lehner, who has a history of concussions. Leon Draisaitl scored in overtime and Connor McDavid picked up two assists as the Edmonton Oilers edged the Boston Bruins 3-2 in their first home game of the season. Two second-period goals by Cam Atkinson powered the Columbus Blue Jackets to a 6-3 victory over the Philadelphia Flyers. CALGARY SUN: Flames GM Brad Treliving said left wing Johnny Gaudreau was fine after being forced to leave Wednesday’s game after suffering an apparent head injury from a high hit by Bruins defenseman Charlie McAvoy. NBCSN: NHL insider Bob McKenzie said the Nashville Predators have started contract discussions with goaltender Pekka Rinne, who’s slated to become an unrestricted free agent next summer. TSN: Pierre LeBrun said the Tampa Bay Lightning and center Brayden Point have agreed to shelve contract talks until the end of this season. Point is slated to become a restricted free agent next summer. THE SCORE: The NHL is reportedly “100 percent open” to adding women to its group of on-ice officials. Was at the game last night and as a Leafs and Pens fan… outcome for me didn’t matter. My preference was for a shootout win. When it comes to games between Leafs and Pens I always root for the team further behind in the standings (which in the past has almost always been Leafs). So I was rooting for Pens last night. That said, this was the very first time I’d seen (in person– i.e. at one of his game) JJ play in. Watching on TV you lose perspective because of the screen capture and don’t see where specifically each player is standing on the play (the big picture). Seeing the whole ice and watching him play made me feel sick to my stomach. He is absolutely brutal. He was out of position over and over and over and over again. When he lined up at RD…. he crossed over well into the left side; often crossing behind his D oponent and not letting him know. Visa versa when he lined up on the left. This left constant exposure for a man not covered in front of the net. If it weren’t for Murray — count another minus 4 or 5 for JJ last night. He had some very solid hits; granted. He had 2 very nice break out passes. That was it for the positive. He must get better; or that is it for the Pens. I reallly believe he needs to sit in the press box for a game or two just to get the perspective of things. Outside of Malkin; I think Haglin had a great game. They were tight on D and played a good systematic game. What they seem to lack was effective quick passes in transition and especially down low. The passes were close but just off and this slowed (often) a great developing play. When the pressure against Pens was on; Leafs just didn’t seem to finish the play. A lot of this was great shot blocking by Pens and some very good saves by Murray. Finally, luck seemed to be tilted in the Pens favour for the game. Bouncy pucks seemed to go Pens way. Missed high stick on Hyman. That was right thing to do though (convo to see if any of the four saw it— don’t guess at how he got cut. I guess they didn’t see which stick cut him; so unfortunate for Leafs but right to do no call). To be fair, refs also missed a high stick by AM earlier in the game. It was to the visor so no damage and play went on. Nothing of importance happened on the play so no harm, no foul for either team. I thought AM only had (at best) 3 good shifts. He seemed a little shell shocked or just not into the game. I agree that Zaitz did play a pretty good game. He needs to do this more. That was probably the best game I’ve seen him play. Overall; outside of the bouncy luck (and missed Hyman high stick) I think it came down to a Pens team that played with more poise and maturity. This will not be the last Leaf game where they are smothered and out played; but these types of games IMO will be few and far between in the regular season. However, this is the type of game that is played in the post season; so Leafs need to be wary of that. For me— I had a fun time at a game I had no chance of being disappointed in from the start. The only let down for me was that the win was in regulation. So Pengo, which leaf jersey did you wear to the game? I have a feeling the only reason the Penguins ever came on your radar is that you were sick of not having a team to root for when the playoffs started. I live in Ontario too, albeit 3.5 hours closer to Pittsburgh than you do, and I have been following the Penguins since the mid to late 80s because they were the closest team that was NOT the leafs or the wings. I can’t wrap my head around being a Penguins fan AND a leafs fan. It’s like insisitng on being drunk and completely sober at the same moment. I don’t need to see Jackass Johnson play live, I can see how terrible he is no problem on tv. And before George freaks out about me calling him Jackass let’s just consider what you call a person that lets his daddy and mommy manage his money for him and doesn’t put 2 and 2 toghether when his parents are buying cars and houses and everything in site. Would the term be “Jackass” perhaps? The guy is absolutely useless and there hasn’t been a bigger elephant in the Pens dressing room since Shero signed Scuderi to his second tour. Johnson has dragged down the advanced stats metrics of every player he been paired with this year. Last night they put Maatta with Letang and then Dumoulin with JO as a shutdown pair and then played Jackass with a very mobile and talented Jusso Riikola in a sheltered role and those combos actually worked really well. Letang is an elite skater and can make up for Maattas biggest flaw which is skating. Dumo and JO 6’4” and 6’7” and both skate and handle the puck well. Now if they could only fix the forward lines and get Matt Cullen off the ice they would have something. LOL. The only dork that “freaks out” on anything in these threads has the gonads to claim I do that. Hilarious. How can the penguins or leaf fans say the defense tightened up? Lol 76 shots on goal in the game I’d say it’s more the goalies played great than the defense tightened up! Dee, I would call Jack Johnson trusting, and perhaps naive. Definitely not a jackarse though. If you would like to see a jackarse, I’d suggest looking in the mirror. Now, give the tough guy crap a rest and be civil, like the good little feller you can be. Wore my future son-in-law’s (… Crosby…yes I’m dreaming) Team Can jersey . Can’t figure out where in Ontario you live that your 3 1/2 hours closer to Pit than me …. the way you were talking before I thought you were closer to Det. Lots of shots from the outside. Also Leafs shots listed somehow different from what scoreboard said …. which was 31????? Anyone still think Ottawa (Colorado) has the best % chance at the # 1 pick next June? They might be in the lottery – but it looks more and more like Detroit will wind up with Hughes. Yes yes yes. Det just not doing well at all. I really like how season is unfolding for Sens. I’m still skeptical that they can be in the playoffs; but they have done well so far. The converse, for me, is happening in FLA. I did not expect them to be winless at this point in time and I DO expect them to be vying for WC spot come first week in April. Oh, I don’t for a fleeting second, believe they’ll be competing for a playoff spot next spring – but I also don’t believe they are the total train wreck a certain somebody kept insisting, calling Dorion a brainless moron at the same time. As I have said repeatedly, it’s fine to come in here and speculate on how we think things will shake out – but when it comes to the FULL story behind team shake-ups we – just – don’t – know. So, so far anyway, things look decent. Oh, I don’t expect those differentials to have continued that way by the end of the year,but some of these guts aren’t showing signs of being the “slugs” a few claimed them to be. It’s like you’re inside my head OBD. Poor Feaster never gets any credit. Smart hockey men for sure. Yeah if the season was only 10 games or any of those numbers were sustainable over a whole season(whether it be Hoffman and Karlsson playing below their standards or the young guys playing above their heads because they want to impress and have a chip on their shoulder, you might actually be on to something. Let’s save the gloating for April if the can keep it up. Nobody’s “gloating” dork – I think most of us are on the same page saying “so far so good” without having any visions of grandeur. That seems to be your personal neighborhood.